What players helped themselves during the week of practice and Saturday’s Senior Bowl game? Bob Gaughan breaks down the players who improved their draft stock. Baker Mayfield, Oklahoma QB- The week started off with him measuring in at over 6 feet tall and with decent size hands. It got better during practices where he looked like the best QB in Mobile. His accuracy was on full display and very impressive. 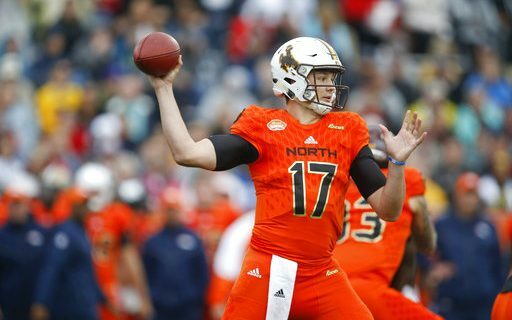 Josh Allen, Wyoming- for most of the practices he showed who he is on tape. He makes some unbelievable great throws and then some head-scratchers. During the game I thought he showed some nice touch one several passes downfield. The fact is someone is going to take a chance on his upside and not the player he is right now. He went 9 of 13 for 158 yards and 2 TD’s in the game. Kyle Lauletta, Richmond QB- Taking home MVP honors during the game was just the end of a great week for him. He went 8 of 12 for 198 yards and 3 TD’s. The comparisons all week to Jimmy Garoppolo can’t hurt. He’s very quick and accurate in the short to medium passes. His ability to go deep is still a question for me but no doubt he helped himself. Marcus Davenport, UTSA-Edge- to me he’s the Josh Allen of pass rushers. You are betting on who he can be rather than who he is. During the game he showed who he could be. He had one sack but more important several QB pressures. He scooped up a loose fumble and returned it for a score. An up and down week ended in a high note for him. James Washington, Oklahoma State WR- There were a ton of questions coming into this week people had on Washington. He answered all of them. His ability to beat press coverage was answered. He has elite speed to be a home run hitter and deep threat. Daesean Hamilton, Penn State WR- he was the best route runner this week. He showed an ability to separate not because of elite speed but because he rarely makes a wrong step in patterns. DJ Chark, LSU WR- not an impressive week of practice but he makes the list because of his 5 receptions for 160 yards and a TD in the game. He made a great hit on special teams too in the game. Kalen Ballage, Arizona State RB- first of all he wins the award for best body. Second he looks like an elite receiving threat for a RB. In fact his receiving skills are more impressive than his ability to find holes as a RB. He did have 57 yards on 10 carries in the game. Guards Will Hernandez UTEP and Isaiah Wynn Georgia – this is a good draft for interior lineman. After Quentin Nelson (Notre Dame) and Billy Price (Ohio State) these two could go in round 2. Hernandez is 340 lbs and is a bull. Wynn shows versatility having played both Tackle and Guard at Georgia. Small College Players Nathan Shepherd-Fort Hays St DT, Alex Cappa-Humboldt State OT- both players showed early they belonged on the same field as the big boys. Shepherd got hurt but was impressive as a 3 technique DT that can penetrate into the backfield. Cappa handled Davenport in the first practice to make his presence known right from the start. MJ Stewart UNC CB- a poor man’s Minkah Fitzpatrick. Can play CB or safety. He’s tough vs the run.. Dominating drills at Senior Bowl. Perfect pattern matcher like Tradaveous White. Kyzir White, West Virginia Safety- Brother of Kevin White Bears first round WR from West Virginia. Showed impressive ability to play physical man coverage. Rashaad Penny, San Diego State RB- He showed his ability to run and catch during the game. The question about him is his ability to catch the ball out of the backfield. He had 137 total yards. A 73-yard TD catch was his hi-light during the game. Bob Gaughan on which players shined at the Shrine Bowl.